Last year, Epson introduced the Home Cinema 8500 UB which combined excellent performance at a low price. It earned our Editor's Choice Award. Now Epson has followed up with the new PowerLite Home Cinema 8700 UB, offering incrementally better performance at an even lower price. It features proven technology - inorganic LCD panels, a killer auto-iris system to bring down black levels, and Epson's Frame Interpolation system. The 8700 UB is a powerful, capable 1080p projector serious home theater that does not cost a fortune--you can pick one up for only $2199, and that price includes a spare lamp. The Epson PowerLite Home Cinema 8700 UB is built for home theater in a light-controlled room, and for this purpose it is indeed well suited. THX mode, with its 660 lumens, provides ample light for most home theater needs. Contrast is excellent, and black bars can scarcely even be seen. However, its high lumen output modes can be useful for video games or television in a room with ambient light. The 8700 UB's Dynamic mode not only exceeds the published specification handily (1830 lumens beats its 1600-lumen rating), but it does so while keeping color balance marginally intact. The result is a much brighter picture that has no garish, obvious color bias or tint, perfect for football games or last Saturday's Pacquiao-Margarito fight, which I unfortunately watched on a television rather than a projector. As far as placement goes, the 8700 UB includes Epson's 2.1:1 manual zoom/focus lens with manual horizontal and vertical lens shift. The 8700 UB can throw a 120" diagonal image from 11' 9" all the way back to 25' 1". The lens shift allows for the projected image to be cast completely above or below the centerline of the lens; the range is just under three picture heights. This is a perfect setup for rear shelf mounting, as it allows for an optically neutral placement of the projector itself relative to the screen. Ceiling mounts are also possible, and the lens shift range will eliminate the need for a drop tube in a room with a standard eight-foot ceiling. The same applies to a coffee table or low shelf situation. 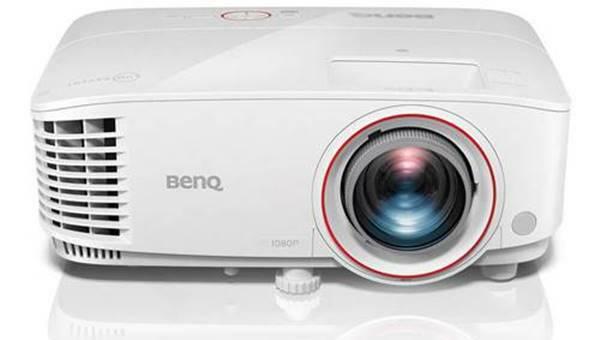 Thanks to the extensive lens shift, the 8700 UB is one of those rare projectors that you really can place more or less wherever you'd like. That said, not all placement situations will be ideal. The "best" set up for the 8700 UB would be using THX mode in a light-controlled room on a mid-height shelf, such that you don't need to use the lens shift at all, and preferably at a distance where you're in the middle of the zoom range. Light output is curtailed by the zoom lens when it is set at its maximum telephoto position--the projector is 36% less bright compared to its lumen output with the lens at maximum wide angle. This drop-off is more or less linear, so when setting the lens at the midpoint of its range you'll lose about 18%. If we assume we are using a 120" diagonal screen, the middle of the throw range would put the projector at sixteen feet from the screen. Here you are at the optical sweetspot of the lens, and getting about 540 lumens in THX mode, which is plenty for a 1.0 gain screen of this size. Low lamp mode will reduce lumen output a further 22%. The end result is roughly 420 lumens which is perfectly comfortable illumination on a 1.3 gain, 120" screen. can you compare the 8700 UB to the PowerLite Home Cinema 8350? is the former worth the extra price? As this (or the 9700UB) is what I will be buying shortly, thank you for the great review. I do believe you have made an error on the Anamorphic Stretch feature. Page 27 of the owners manual clearly states that the internal scaler will do the vertical stretch and you can even configure the trigger output to work with this function. In fact I bought an CIH lens in anticipation of getting this projector... So the manual better be correct! I am ready to buy this now, but I dont want to but it and find out a week later that Panasonic releases a new model in this range. I have a AE900U and love it. 4 years and 2900 hours on one lamp with no issues at all. For that reason I would love to stay with Panasonic, but why would I drop 2k on a old model 4000 when all the other companies are dropping new models. Has Panny made any statement about expected new models? Any leaks? In regards to lumen output which is said to be 660 at wideangle (12 feet? )and 550 at the "optical sweet spot" of 16 feet ... The recommendation appears to be to lose 110 lumen to get into the optical sweetspot. How is 16 feet better than 12 feet - How does it show? Considering this projector I'm wondering if there are any wide angle converters or attachments for these projectors? I have 14 feet distance and 80 in diagonal screen. Will this projector work for me? That is a great question, and I hope you consider it Bill. It would be great to see a step-through up a product line to see what the extra investment buys for the user. If you still have them in-house it would be great to see a comparison between the HC8350, the 8700UB, and the Professional series. Obviously the extra $900 buys a second bulb and better warranty, as well as better performance...but what is the nature of that upgrade to the eye, and utility of the projector? I would love to chime in on the most anticipated question, and perhaps the hardest. I kept waiting for it reading the review - 8700UB vs 8350? I am wondering primarily about the drop in lumens with the 8700UB. Tough decisions, but good choices to have! James.....I cant give you a comparison on these two projectors but I have the 8700UB just got it for xmas, and I am very pleased by the brightness of the projector for say football etc. with some lights on in the room. I have a media room with dark walls and a white ceiling. The image is being thown up on a home made screen using dalite cinema vision high contrast material (gain 1.1 i think). The picture is bright and dynamic with some moderate lighting in the room. I purchased the epson 8700 2 weeks ago and was very glad that I chose the 8700 instead of the 8350. I figured that difference was about $800, but with the free lamp offer with purchase of the 8700 valued at $300, the actual difference was about $400-$500. Let's me say this: the 8700 is fantastic! my setup includes a basic 120" 16:9 white (1.3 gain), fixed Elite screen; yamaha 3050 soundbar, sony s570 bd dvd player, mediabridge hdmi cable (6 feet x1; connecting sony bd player to yamaha); and CL2-rated, 22-gauge (very thick diameter) hdmi cable purchased from amazon.com (35 feet x1; connecting yamaha's hdmi output to epson's hdmi input). without calibrating or making any changes to default settings on the epson 8700, the picture was unbelievable. it rivals that of my 58" 1080p panasonic plasma tv. on closeup, I saw every wrinkle and detailed textures of the actors' faces. Dark scenes were indeed black. Placement cannot get any more flexible (no dedicated projector stand needed!). I placed it about 16 feet on a coffee table in front of my sitting area and the lens shift threw a beautiful picture on the screen with slight adjustments. The only con that I can think of is that although its noise is rated at 26 (or 28 dB), you can still hear it, but only if you pay attention to it. Once the movie starts, the noise does not focus your attention. Again, if you can afford $500 more, do not buy the 8350. Go with the 8700! I replaced my Panasonic projector with Epson 8700UB and can confirm that the internal scaler does Vertical Stretch and for those using CIH anamorphic lens for 2.4:1, this is the best projector hands down, in the price range. Hi, I own a Epson 8700ub and its already on the ceiling of my home theater room, 10' high, throw 18' to the wall, my big concert is the with screen side is better a 120" or 135"....I need help to make a final decision. Amazingly, neither the review or the comment section makes mention of the 8700's noisy auto iris which is driving me nuts. If mounted close to your seated position and if you are sensitive to it, this thing, to quote a review i just read, sounds like a "gurgling coffee pot". This is destroying my opinion of an otherwise perfect $2K projector. If Epson replies to my complaint, I'll post it. Conditions: 110" Stewart screen, approximately 18' away from the projector, with the top of the screen about 20" lower than a ceiling-mounted lens. Would an expert tell me what top-rated, best-value projector is best suited for the mentioned conditions? Is Epson 8700 UB? I appreciate your inputs. I was between the 8350 and 8700ub. End up with the 8700ub with the Visual Apex 100" fixed screen. Couldn't be happier with the prices and buying process from Visual Apex. Shipping was fast too. Does anyone know the answer to Sams question? I also am trying to decide between the two. I will be using it for sports/tv in a room with a fair amount of ambient light. 8700 vs. 9700 Other than warranty and a black case, what does the extra $ buy me? I've compared every specification I can find online and I haven't seen anything different... Am I missing something? JOSH- 9700 gets a three year advanced exchange Warranty (including issues with the bulb, a second bulb, A very nice sturdy ceiling mount (really is better than any sub $200 mount I can find)a few adjustment modes, a support for Anamorphic lens. Most people shy away because of the price, but let me tell you after using 3 different projectors over the past 6 years. I want a 3 year advanced exchange warranty and a spare lamp. I have the same issue, 18 ft throw distance, 18 ft seating distance. I ordered the Epson 8700ub with a 120 inch screen but really want to go bigger, with the 135 inch screen. Will I lose resolution? What did you go with and do you regret it? Any help is much appreciated. I have a 6500ub right now I've been using with a DIY 200 inch diag curved theatrical wide screen (2.35-2.40 aspect ratio). The 6500ub has the same lumen spec as the 8700 (which I'm now upgrading to). It's plenty bright in cinema modes with controlled light and can still do well with some ambient light when a brighter setting is selected. Can you please post your 8700UB calibration for total dark room? Thanks! I bought the 8700 used for $1,150 with 250 hour on the lamp, I made my own frame and bought a screen from Ebay that is for a 140 screen. Instead of wraping around the frame, I stretched it out so that I now have a 142 screen. I can not believe the pictures quality and colors that I see, I plan to add a velvet border and hanging the projector from the ceiling. For the price of a 60 inch TV, the projector with 140 inch screen is the way to go! as an engineer, I constantly read available info on most of my online purchases. Our home was still under construction at the beginning of 2009. I hired a professional media tech too pre wire the home for complete sound and he wired the media room for Dolby 7.1 before there was media for Dolby 7.1. We waited until May of 2013 to install the the speakers and tuners for the different floors. He installed Denon tuner and Tannoy speakers. The tuner was not available on Amazon until March 13, 2013. We are very thankful that we waited for the equipment availability before install. I researched the projector extensively. I contacted visual Apex and the salesperson I spoke with was also an engineer. the media tech installed a Sonos playbar for the living room. We purchased a solid projector screen (120") with a 1.1 gain from Visual Apex. I run the projector in Eco mode and am more than impressed with the picture. My personal visual acuity, I believe, is such that the Epson 8700ub is as good as I can see. I think that next generation projectors from Epson should logically be better than their predecessor's. For totally dark room I use Eco mode and THX. Note sure if one negates other but I think not. I do suggest that you have decent convective heat transfer for your lamp. As I stated somewhere, we have 15' ceilings and so the ceiling fan stays out of the way.. Also, the room was built from the beginning as a media room. With all of the 8700UB bulb failures I have read about my guess is that either there is poor cooling to the lamp or thermal shock from rapid changes is lamp temp. or a combination of both. For a do it yourself set up perhaps a small quiet focused fan to move the heat. Has anyone else had issues with a pink band of discoloration along the bottom of the screen, and a blue green discoloration along the top? It showed up about a year after the warranty expired on my 8700 UB. I took it to a place that fixes projectors but they said it was a $2000 fix so no point in doing it. Not impressed to only get 3 years out of the thing and now I need to buy a new projector at some point. I'll probably go Panasonic next time because apparently they are easier to fix. Yes I have the pink on the bottom and blue at the top. I really don't notice it because I am looking at the fantastic picture in the middle. You have to look for the blue at the top and the pink on the bottom is very washed out. Someone said I should pull the lamp out and push it back in. I haven't tried it yet, but it supposed to be from the lamp cooling and heating.